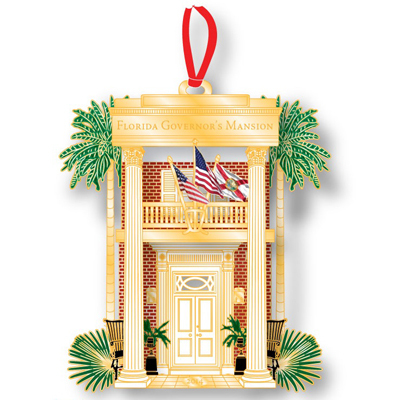 This beautiful ornament, crafted in the USA and finished in 24k gold, features the three flag display above the entrance to the Florida Governor's Mansion. The three flags commemorate Florida's statehood, the United States flag, and the State of Florida flag. This stunning ornament comes in a special gift-box with an explanation of the design. It makes the perfect holiday gift for family, friends, business associates, or even yourself.